Choose VAT Free Commemorative Gold Coins from the United States and Canada as an exciting addition to your collection or as a great way to boost the value of your portfolio. Some of the most popular Gold Commemorative Coins include the 20 Dollar Canadian Centennial of Confederation Gold Coin that was issued by the Royal Canadian Mint in 1967 to celebrate 100 years of the Dominion of Canada. It was the mint's first ever 20 Dollar Gold Coin and part of a striking series of Centennial Coins. The United States of American Medal of Honor Gold Coin is another interesting option. 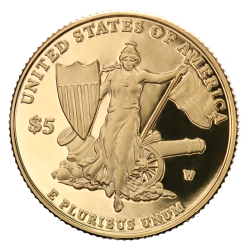 Issued by the United States Mint in West Point, New York, this beautifully designed coin has a purity of .900. Discover Commemorative Gold Coins at great prices and Free from VAT with coininvest.com for fast, insured shipping. Commemorative coins have been a popular item since antiquity when the Greek took them to their hearts. Given the Romans were also enthusiastic for special edition bullion, it should come as no surprise that the united States produce the pinnacle of commemorative coins in the modern age. A popular purchase with collectors and investors, USA commemorative coins are a comfortable fit in any portfolio and are more affordable than you would expect! USA commemorative gold coins are available to buy from the CoinInvest website. All you have to do is click on the image of your choice from the collection above to go through to the product description page. From there you can add the product to your shopping basket and either proceed to check-out or continue browsing. Modern United States commemorative coins were first launched by the US Mint in 1982. The first coin was a silver issue for the 250th anniversary of the birth of George Washington. They feature a wide variety of themes including events and anniversaries of significance, landmark buildings and monuments, as well as personalities of national or international importance. The first US commemorative gold release was the 1984 Summer Olympics Ten Dollar Gold Eagle/Runners, although most American commemoratives are silver coins and come in five different sizes over the years. The reason for this is that the US Government is following a low-cost policy for these coins in order to make them affordable to as many people as possible. And you can be sure that there is a vast range available for every taste and budget. Pluralism and grand scales is the American way after all! A great number of countries have issued gold commemorative coins which are always in high demand by collectors around the world. But no nation has surpassed the United States when it comes to the variety, credibility. People who collect commemoratives are usually geared more towards the theme and historical aspect of collecting rather than the potential investment value, although in some cases this should be taken into consideration as well – especially when you consider the fee these collector pieces bring. When more popular subjects are portrayed, commemorative coin sales are higher, often reaching the maximum authorized mintage. Recently, the 2001 American Buffalo Commemorative and 2006 Benjamin Franklin Commemorative coins were almost an instant sell out. And don’t forget, each commemorative coin is unique and only struck once. The popularity of commemorative coins generally fluctuates with the subject matter. It is the historical features of the commemoratives that create interest among many people who would otherwise have little interest in purchasing gold coins. But then again, sometimes tastes change, and it is all too natural for you to decide to trade in some of the pieces that are no more appealing to you. Liquidity is a very important element for an investment, and that’s actually one of USA Commemorative Gold Coins’ strong points: with their unique backing by the United States Government (the US is the world’s largest economy),they can easily be sold for cash at most precious metals dealers worldwide. In general, though, people come so attached to the items of their collection that selling them is not an option. Although USA commemorative coins are legal tender, they are not minted for general circulation. The United States Mint sells commemorative coins to the public at a pre-issue discount price for the first month of sales, and then regular prices for the remaining sales period. Authorized by US Congress, commemorative coins are crafted to be rich in symbolic history. Each commemorative coin is produced by the U.S. Mint in limited quantity and is only available for a limited time. Most commemoratives are available only during a certain calendar year. USA Commemorative Gold Coins are high quality products that not only capture the American culture but also provide beautiful additions to any coin collection. And there are so many to choose from that you are most certainly bound to find some to suit your taste for a generous gift to your loved ones! Although not all USA Gold Commemoratives bear mint marks, they have been minted over the years in all official branches of the US Mint. They are issued in 90% pure gold, in brilliant uncirculated or proof quality and in two sizes: they are struck with a net weight of .4837 ounces, and a face value of $10, or, in the case $5 gold coins, with a net weight of .2418 ounces. These splendid coins are engraved by profoundly talented American artists and the diversity and range of designs seems to be endless. The American Eagle and the statue of Liberty appear to be popular motifs, while inscribed we find some (or all) of the mottos "LIBERTY", "E PLURIBUS UNUM" "IN GOD WE TRUST" (appearing on all US gold coins since 1908) and sometimes "UNITED STATES OF AMERICA. Also displayed are the date of issue, in some cases the nominal value of the coin, and legends relevant to the theme. USA Commemorative Gold coins have been struck by the United States Mint at all four active coin-producing branches: Philadelphia, Denver, San Francisco, and West Point. The West Point branch is the newest US mint facility, gaining official status as a branch mint in 1988 and its "W" mint mark is the one most commonly found on USA Commemoratives. The United States Mint strives to produce coins of consistently high quality throughout the course of production. The mint’s strict quality controls assure that coins of this caliber are produced from each die set throughout its useful life. In the US Mint’s advanced technology manufacturing facilities a die set is used as long as the quality of resulting coins meets United States Mint standards, and then it is replaced , continually changing sets throughout the production process. Buying from a reputable dealer you can be 100% certain that you are getting what you paid for, even if the premium tends to be a little higher. As leading distributors of bullion products, CoinInvest is always keen to hear from anybody with gold investment coins for sale. Therefore if you do have any commemorative pieces from the US for sale, please contact a member of our staff who will be happy to calculate an offer on your behalf. We offer competitive rates and promise to propose an offer based on current spot market value.